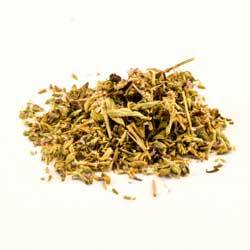 Pennyroyal has been used in herbal lore as a relaxant dating back to ancient times. It was even once reportedly used during the Greek Eleusian Mysteries. It was recognized and burnt as an offering to the deity, Pachamama, by the shamans of Peru as well. This is a plant that's rich in shamanic history. This product is not intended for human or animal consumption. It's sold for for use as an incense, or for aromatherapy purposes only. There are two similar plants that go by the name Pennyroyal, one native to Europe (called European Pennyroyal) and one native to North America (called American Pennyroyal). Both are members of the mint family and grow in temperate regions of Europe and the Americas. Pennyroyal has pale purple flowers that grow in clusters and have small, bright green leaves that are unlike the leaves of other plants in the mint family. It grows about 16 inches in height.